While we often try to save as many teeth as we can, there will be times when we are unable to save a tooth and the tooth has be extracted. Broken tooth, fractured root, advanced decay, periodontal gum disease are among the common reasons why a tooth may need to be removed. 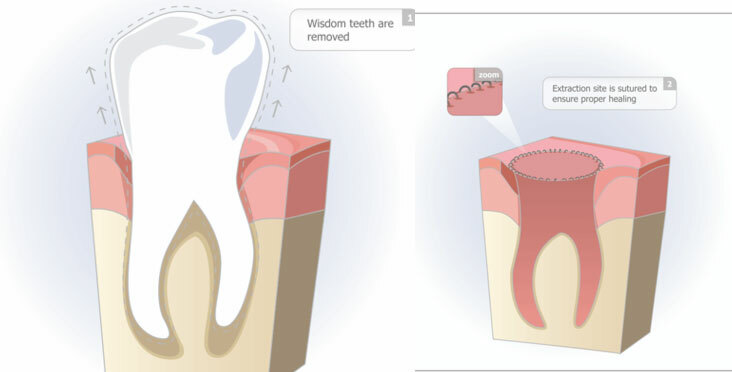 Another common reason for tooth removal is wisdom teeth. They erupt through your gum but your jaw is too small to hold them. As a result, they force other teeth out of alignment and can damage your bite. When your jaw is too small to accommodate normal wisdom teeth, gum or jaw discomfort and swelling often occur. In addition, there is a greater risk of developing gum disease. Surgery to remove wisdom teeth is typically the best course of action. Call us today to schedule a consultation! “The entire office and staff of Friendly Family are outstanding. I have never had such an amazing dentist in my life. Dr. Henna Is extremely professional, kind, and highly skilled. Her prices are absolutely fair. My wife and I could never imagine of ever going to another dentist. Dr. Henna's assistants are above and beyond polite. I have never had such positive experiences with any other dentist office. Friendly Family is the best!” - Jesse O.